A fairly quiet week for the markets, price-wise; it was anything but quiet when it came to the news. Every day there was something new: G7 fallout, a summit with North Korea, and new tariffs on Chinese goods. Any one of these could have soured investors, yet prices were resilient. 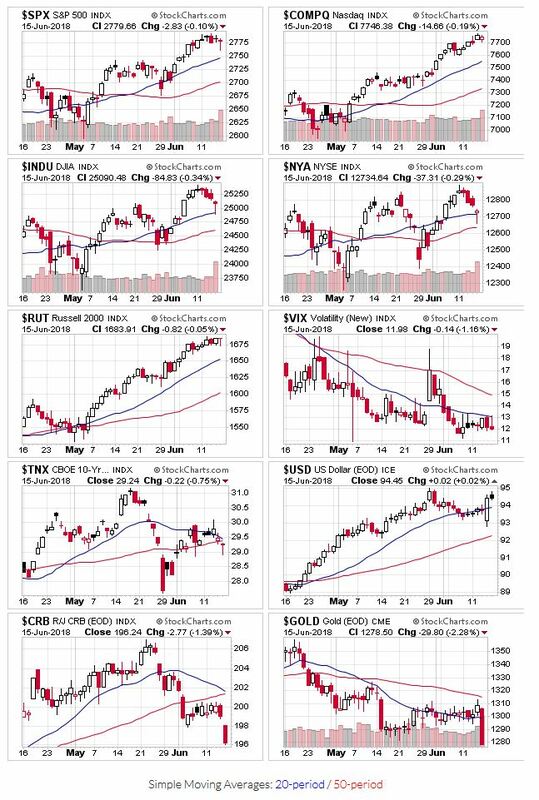 All the indexes are remain above their 20/50-day moving averages. 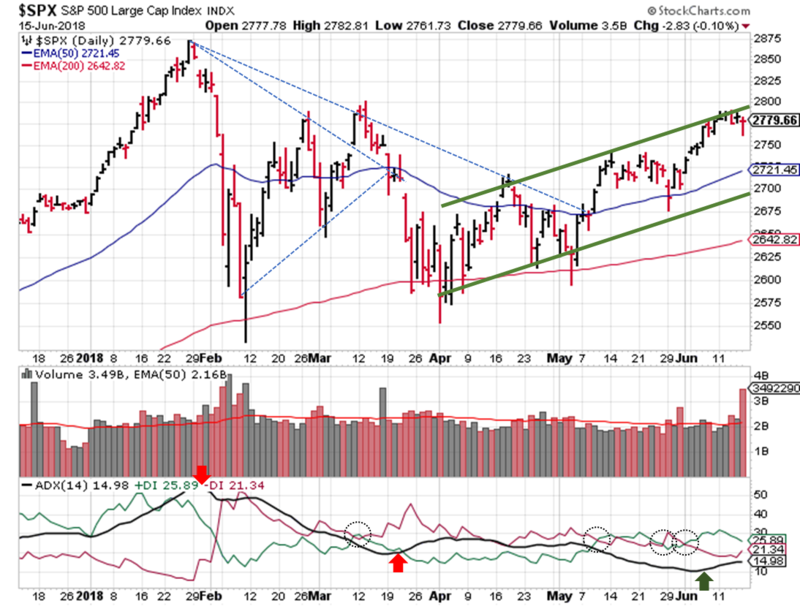 The Dow Jones ($INDU) briefly touched the 20 on Friday, but recovered before the close. The markets saw some distribution last week, but that likely has more to do with options expiration than any market weakness. For now, the count remains within acceptable limits, so no change in this signal. OEW remains in an uptrend, and Tony is reiterating his call for 3,000 on the S&P. Now that those signals are out of the way, let’s take a closer look at the S&P ($SPX). No change in the ADX this week. Near term, it looks like the S&P may take a breather again (sideways or even slightly downward price action), as we bounced off the upper price channel last week. As far as support, the 50-day moving average sits ~2% below the current price, while the lower channel is ~3% away. Not many new break-outs last week. Many of the stocks I watch are digesting their recent run-ups, so that’s not too surprising. We may have to wait a few weeks to see which sectors power the uptrend further, as we just ran into that resistance at the upper channel and the summer travel season kicks off in two weeks with the 4th of July holiday in the U.S.